Team pictured from left to right, back row: Dr. Rebecca Creasy (Advisor), Lucas Haskins (undergrad, Junior), Michael Diehl (undergrad, Senior), Jacob Webster Jones (undergrad, Freshman); front row: Ciera Castillo (undergrad, Senior), Amber Compton (undergrad, Senior), Katie Duke (Team Captain, Master’s student), Kimi Votaw (undergrad, Senior), Addison Gilbert (undergrad, Senior). Congratulations to the Food Science and Technology students on the Institute of Food Technologists Student Association College Bowl team for winning second place in the South Central Region competition on March 30, 2019. Since 1985, the IFTSA College Bowl Competition has tested the knowledge of student teams from across the United States in the areas of food science and technology, history of foods and food processing, food law, and general IFT/food-related trivia. The College Bowl is designed to facilitate interaction among students from different universities, stimulate the students’ desire to accumulate and retain knowledge, and provide a forum for students to engage in friendly competition. A recent study led by researchers at Texas A&M University shows how a novel regulatory mechanism serves as an important biomarker for the development of diabetes, as well as a potential therapeutic target for its prevention. The study can be found online in the November edition of the journal diabetes of the American Diabetes Association or at PubMed. “Glucagon and insulin are the most important pancreatic hormones in target tissues, such as the liver, in control of proper glucose levels in response to food intake,” Shaodong Guo, associate professor and Texas A&M AgriLife Research scientist in the Department of Nutrition and Food Science, said. Guo said an excess blood glucagon level is present in animals and humans with diabetes, stimulating excessive HGP and contributing to diabetic hyperglycemia. Phosphorylation, the attachment of a phosphoryl group, is important for protein function as this alteration activates or deactivates almost half of the body’s enzymes, regulating their function. To establish how this Foxo1 phosphorylation would work in an animal model, the researchers used CRISPR/CAS9 technology in the generation of Foxo1 ‘knock-in’ mice to use in their investigation. “This result, along with what we learned from some the previous research done in conjunction with the department, showed we had identified a novel molecular, cellular and physiological mechanism by which Foxo1 mediates glucagon signaling via phosphorylation to control hepatic gluconeogenesis and blood glucose,” he said. Guo said this study further demonstrated that Foxo1 is a mediator of multiple signaling cascades and integrates different hormones and intracellular protein kinases into the programming that controls insulin sensitivity, HGP and blood glucose. Dr. Chaodong Wu was invited to participate and present at the First International Conference on Precision Nutrition and Metabolism in Public Health and Medicine. The conference was held September 21 – 26, 2018 in Chania, Crete, Greece. During the conference, Dr. Wu delivered a speech on obesity-related circadian dysregulation and insulin resistance. Also, Dr. Wu was invited to participate and present at the 22nd Scientific Meeting of the Chinese Diabetes Society (CDS2018). The CDS2018 was held November 28th – December 1st, 2018 in Suzhou, China. During the meeting, Dr. Wu delivered a speech on the protective role for adenosine 2A receptor in inflammation and insulin resistance. Dr. Robert Chapkin is the William W. Allen Endowed Chair in Nutrition and Chronic Disease Prevention at Texas A&M. He is a University Distinguished Professor, Regents Professor and University Faculty Fellow in the Program in Integrative Nutrition and Complex Diseases. He is also a Texas A&M AgriLife Senior Faculty Fellow. 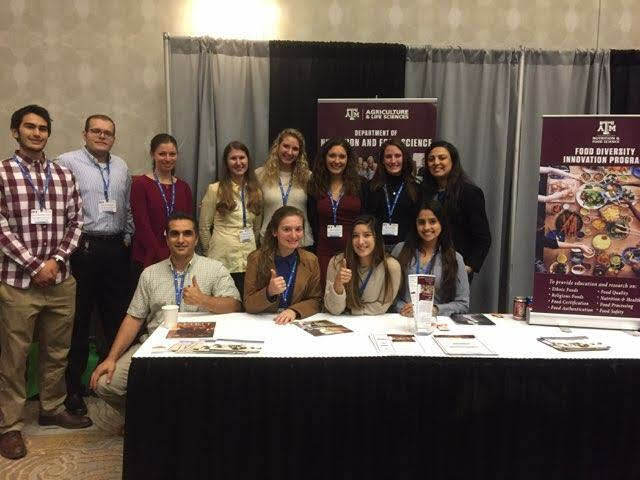 Students and faculty shown promoting the Texas A&M Nutrition and Food Science Department to other food industry professionals. From left to right, back row: Jacob Webster-Jones (freshman), David Cornejo (junior), Shayna Smith (senior), Dr. Rebecca Creasy (faculty), Amanda Kunz (post-bac student), Taylor Romero (junior), Emily Close (senior), Helen Sarbazi (graduate student). From left to right, front row: Mehdi Hashemi (graduate student), Katie Duke (graduate student), Ashlei Trevino (junior), and Tajinder Kaur (junior). The Texas A&M Nutrition and Food Science Department was well represented at the recent Longhorn Institute of Food Technologists (IFT) Technical Sessions and Suppliers Night event. Twenty-five undergraduate students, three graduate students and two faculty members took part in the annual event that included over 300 Exhibitors and over 1,000 attendees. The students and faculty networked with ingredient suppliers, processing equipment manufacturers, food scientists from Consumer Package Goods (CPG) companies, and third party food analysis lab representatives. The group also gained new insights into sugar reduction challenges in the beverage industry and challenges to pathogen detection in different food matrices during the technical sessions. Our department also had the opportunity to promote our new Food Diversity Innovation Program to food industry professionals.